10 Value Added Realtor Benefits~Are You Listening? 10 Value Added Realtor® Benefits ~ Are You Listening? Good listening skills take practice, concentration and work. We all know the difference between u-huh, u-huh…and actually being “heard” and understood. A good Realtor® has honed their active listening skills in order to become a Great Realtor® by knowing the right questions to ask and by listening to the answers. 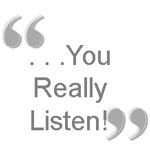 Interested in improving your business and personal listening skills? Try a free online listening test. Check out any book store for good titles or try, Listening The Forgotten Skill by Madelyn Burley-Allen. I’ve been a Realtor® for 16 years helping real estate buyers and sellers on the Main Line Pa and Chester County. I work at my listening skills professionally and personally. Because I’m curious, I ask a lot of questions. I like to understand how things work and how we each think and feel differently. what are your needs; home, schools, commute? why do you want to buy/sell? where are you going? being relocated? what will you do if you don’t /buy/sell? do you have a wish list? a must have list? where is your family located? When I first started in Real Estate, a client said to me, “You don’t seem like a real estate agent”. Uh-oh I’m thinking, maybe I’m not meeting the buyer’s expectations! We both chuckled about the stereotype (sort of) – Seems that I was their second Realtor®. We were in the process of clarifying their needs. They wanted “new construction” but close to town; not quite their price range, but close to town turned out to be a higher priority than new construction. I later sold or “listened” my way to the sale of a perfect home they would later happily renovate to be like “new“. Selling real estate can be a “telling” business when it should be more of a listening business. The best Realtor’s® know and practice their active listening skills in consulting, identifying needs, negotiating and resolving issues. Contact me, Judy Peterson 610-889-5509 when you need a Realtor® who will listen to ALL of your unique real estate needs. I can help you! This entry was posted on Thursday, August 14th, 2008 at 6:07 pm	and is filed under Home Buyers, Home Sellers. You can follow any responses to this entry through the RSS 2.0 feed. You can leave a response, or trackback from your own site.